Marble is the premium worktop in London material that merits a place in every kitchen. Available in a range of colours, no two marble pieces are ever alike thanks to the unique way that metamorphic rock creates its gorgeous surface designs. But while it may seem more practical to choose a neutral caramel or even a dramatic black, there’s no more showstopping material for the contemporary kitchen worktop in London than white marble. Kitchen design fashions come and go but white has a timeless appeal that never goes out of style. If you’re investing in high-quality marble worktops in East London then white will never date and creates a really stunning finish whatever the colour of your cabinets. And if you do decide to switch up the colour of your accessories, sleek and stylish white remains the perfect complement to any design scheme. Marble adds a beautiful tactile feel to your kitchen thanks to its smooth texture. It’s the ideal choice for keen pastry chefs and chocolatiers too since marble stays cool whatever the temperature of your kitchen. It’s also extremely heat resistant unlike other stone worktops in London and there’s no need to use a cloth or trivet, although they will guard against any possibility of thermal shock. Crisp, clean and fresh, marble is also easy to keep clean and won’t stain provided you have it sealed and then resealed regularly. Supremely practical, white marble is beautifully functional in the kitchen. 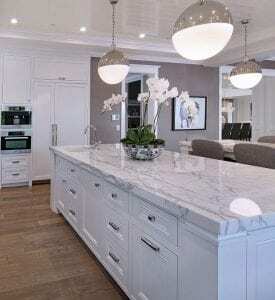 Glossy white marble worktops in London look stunning used in a large kitchen or on an expansive island unit, but if you only have a small galley kitchen don’t despair. A polished white marble worktop will reflect the light, bouncing it around a smaller space and giving the illusion of size. That way you can create the impression of a much larger kitchen. Ultimately, nothing beats the luxurious look and feel of white marble. When properly sealed and cared for it maintains its good looks without staining or scratching while delivering a design statement that’s hard to beat. If you’d like to bring the glamour of Botticini or any of our other premium marble worktops in London to your East London kitchen then get your free instant estimate and samples today. If you are looking to buy marble worktops for your new kitchen, Please do not hesitate to get in touch with Palazzo Stone.